Pura Naturals Pet was presented with eight product awards. The awards include four 2018 Family Choice Awards and four 2018 Pet Age Readers’ Choice Awards. 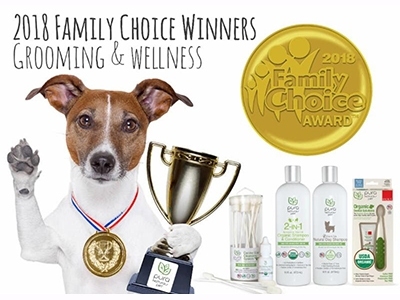 The four product winners of the Family Choice Awards were the Organic Dental Solutions from Pura Naturals Pet and partner Radius Corporation, the Pura Naturals Pet New & Improved Canine and Feline Ear Cleansing Systems, Pura Naturals Pet Flea & Tick Dog Shampoo and the Pura Naturals Pet 2-in-1 Avocado & Olive Oil Organic Shampoo & Conditioner. The Family Choice Awards recognize the best products, services and resources for all members of a family including our cherished pets. Pura Naturals Pet 2-in-1 Avocado & Olive Oil Organic Shampoo & Conditioner won the 2018 Pet Age Reader’s Choice Top Award. The Pura Naturals Pet Flea & Tick Natural Dog Shampoo, Feline Ear Cleansing Kit and Pura Soft Blanket with embroidery options all received a Top 3 Choice Award. The Reader’s Choice Awards were voted on and decided by retailers, groomers, manufacturers and other pet related businesses.